CP Pistons, Suzuki GSXR 1000 Pistons for those that demand the ultimate in engine performance! We are a proud distributor of the entire line of CP Pistons premium forged pistons for the Suzuki GSXR 1000 motorcycle. Available here you will find Suzuki GSXR 1000 piston kits for standard bore, big bore, high compression and stroker engines. We also have forged pistons for GSXR 1000 turbo engines. These superior forged GSXR1000 pistons will work with oversize valves as well as high lift camshafts as they include oversize valve reliefs. They incorporate a "X" style forging or a full box style on the Project X series pistons, for greater strength, durability and reduced weight. Along with the full radius dome designs, high performance piston rings and lightweight piston pins, these pistons offer the highest quality and are engineered for maximum power output and durability. Buy the best Suzuki GSXR 1000 pistons, buy CP. When it comes to Suzuki GSXR 1000 performance parts for your engine, forged pistons and Carrillo rods are excellent additions to your project and will help improve torque, horsepower and reliability. CP Pistons Suzuki GSXR 1000 performance parts are used by top professional riders and teams. Project X Series pistons are the result of the latest in ultra high performance technology improvements from CP. Pistons listed below with "MX" preceding the part number are part of the new "Project X" piston line up. Piston and gasket kits with a "CPKX" preceding the part number include a Project X series piston in the kit. Piston Kit includes: 1 Piston, 1 Piston Pin, 1 set Piston Rings, Pin Lock rings for 1 cylinder. Use to order any quantity of pistons less than a full set of 4. Change quantity in shopping cart to get the number of pistons needed. 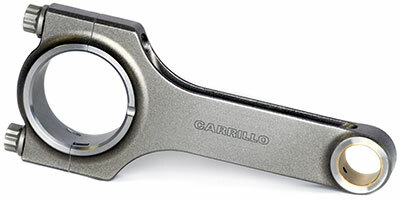 Premium Carrillo GSXR 1000 connecting rods provides superior strength for extreme high performance and racing Suzuki GSX-R1000 engines. Designed with legendary Carrillo quality to give you an extremely strong and dependable replacement connecting rod at a reasonable price. Can be used as a stock replacement connecting rod as well as for high performance and racing engines, including big bore engines. These rods come equipped with CARR bolts and are a great complement to the Suzuki GSXR 1000 pistons listed above.